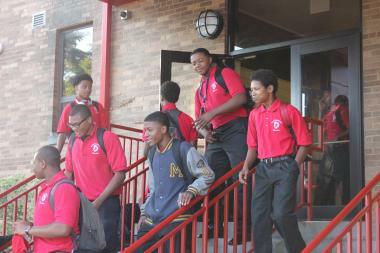 Despite falling short of its $300,000 goal, the Bronzeville Catholic High School will remain open. CHICAGO — Despite not reaching its goal of raising $300,000 in less than a month, Hales Franciscan High School will remain open next school year, the school announced Friday afternoon. "As of today, we will open in the fall. Our Board of Trustees says we have reached enough donations that we feel confident enough to move forward and finishing through the school year," said Nichole Jackson, principal of the historically African-American Catholic school, at 4930 S. Cottage Grove Ave. in Bronzeville. In early May, Jackson announced the school had until Friday to raise $300,000 or the school "will be forced to cease operations for the next school year." "I think it's definitely doable. It seems like a lot, but if people know the history of the school, they'll be willing to do what it takes to make sure the doors will be open," Jackson said at the time. Despite her confidence, the school fell well short of its goal, raising a little more than $11,000, according to its GoFundMe page. According to Jackson, the average cost to run the school per year is $1.5 million-$2 million, which covers teachers' salaries and day-to-day operations, among other expenses. This school year, operating on a "bare bones" budget, the budget was about $1.2 million. The school, which opened in 1962 as an all-boys high school, received a $5 million grant from the Michael Jordan foundation in 2007. The grant gives the school a half-million dollars each year for 10 years. The school also receives tuition. The money that was raised will help offset expenses for the next school year, Jackson said. But the school's financial woes are far from over, she said. "The battle is not over, we're still in financial trouble," said Jackson, adding the GoFundMe page would still accept donations and has no deadline.